David Keene– The ISE show (Integrated Systems Europe) in Amsterdam, which wraps today, is both the “InfoComm/CEDIA of Europe” (in fact those two Associations organize the show), and probably the fastest growing AV-related trade event anywhere (826 total exhibitors this week, up 15 percent over last year, and some 35,000 attendees on hand.) Digital Signage is an “official” part of the show, with a special conference, and with digital signage exhibitors on the show floor. I’ve written here often, about the topsy-turvy nature of an industry– pro AV– that not that long ago featured new-gen technology introduced first on the “pro” side and then trickling over to the consumer side. But the industry is now more often characterized by the large electronics manufacturers putting more R&D $, first, into the booming CE (consumer electronics) channel. So the ISE show- with its combined CEDIA-InfoComm genetic pool, should be ground zero for that. And indeed it seems to be. ISE this week has seen the introduction of CEDIA (home theater) type of products that portend changes in the commercial AV/digital signage side, as did CES last month. 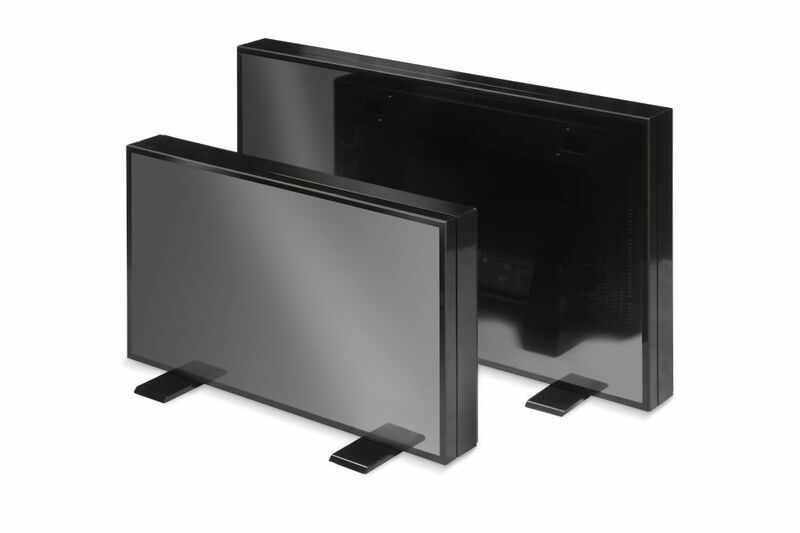 More transparent LCD (Samsung, LG, Viewsonic, Vestel, and others). “Hybrid” video projectors (Casio, and now Viewsonic) that use an energy-saving design that replaces the mercury lamp in projectors with a LED and Laser hybrid light engine– creating a “lampless” projector. On the strictly digital signage side of the fence, ISE saw some interesting new product releases– but most of the new on the digital signage front was about Content Management Software providers. After all– the barrier to entry here is low, so there are hundreds of software providers that can pretty easily tweak a software package imported from some other industry and trot it out. Of course, the more established software providers that have paid their dues in digital signage cut through the hype, as they have done here. Interestingly, Christie– who makes the very unique and successful MicroTile displays based on a LED light engine DLP projection cube, entered the Content Management Software arena this week at ISE. Here are a couple of press releases from ISE, with some news supporting these trends. Expanding its projector product portfolio, ViewSonic announces the world first full HD 1080p home cinema Laser Hybrid LED projector. ViewSonic's latest Laser Hybrid LED projectors incorporate a state-of-the-art hybrid light engine which facilitates vivid colour display and performance. The LEDs and lasers combine as a light source to create vibrant and rich display colour, which generate a colour spectrum exceeding that of normal mercury light projectors. Furthermore, this new technology delivers a longer light source life of up to 20,000 hours for greater energy and cost savings. In addition to longer lamp life, ViewSonic Laser Hybrid LED projectors also provide versatile colour modes and 1,200 lumens of brightness for the best effect at home. The projection performance is absolutely radiant with exceptional colour accuracy. Coupled with the high lumen output and pure colour correction and filter, it presents an absolutely authentic level of the three primary colours, red, green and blue which significantly expands the colour gamut and presents clear and concise images, even in the brighter ambient. Moreover, the instant on/off function eliminates the need for a cool down period associated with conventional lamp-based projectors, providing a user experience as friendly and trouble-free as possible. ViewSonic Laser Hybrid LED projectors feature Full HD 1080p high resolution, the ideal solution for top of the range home cinema performance. Also, full analog and digital connectivity allows easy setup concerning all media and DVD players. ViewSonic Laser Hybrid LED projectors will be available from July 2012. ISE/AMSTERDAM, Netherlands – (January 31, 2012) – Christie® today announced the official launch of its Christie JumpStart content management solution at the Integrated Systems Europe (ISE) show in Amsterdam. JumpStart makes it easy to put stunning, high resolution content onto a multi-display or tiled digital canvas. Christie JumpStart targets architectural markets including museums, universities, stadiums, corporate offices and retail stores needing high resolution, reliable content playback across large video walls. Rental stagers will also benefit from JumpStart’s speed and ease of setup, and support for unique display configurations. Combining user-friendly JumpStart software with reliable HP hardware, Christie JumpStart enables users to position and play back a wide range of content including video, graphics, applications, Blu-ray and DVD movies, remote video sources, color swatches and text. When used with Christie MicroTiles, Christie JumpStart communicates directly with the master External Control Unit (ECU), automatically picking the best resolution for the MicroTiles canvas, regardless of shape or cabling layout, and showing the location of every tile so that snapping content into position is a breeze. Christie JumpStart is now shipping with a three-year warranty and the hardware bundle is backed by HP, providing peace of mind. Winner of 18 industry awards since debuting in November 2009, Christie MicroTiles are installed throughout the world including Seoul’s Incheon International Airport, theNASCAR Hall of Fame, London Stock Exchange and Deutsche Bank’s Asia Pacific headquarters in Hong Kong. With the is5+ system, content only needs to be entered once, where it will then be processed specifically for each device and provided to target devices for optimal presentation. Individual templates allow for simple content management and ensure that visual identity is maintained across multiple systems. MultiTouch and interactive scape will also demonstrate the is5, by interactive scape, a beautifully designed, 55” level table surface combined with a slim Corian-body that seamlessly incorporates into any environment. The is5, which uses the MultiTouch MT550 MultiTaction Cell 55” product, is also available as a wall-mounted unit. The MultiTaction Oblique Wall, measuring 3.5 meters wide and 2.5 meters tall, features six MultiTaction Cell 55” units, and will run a multi-user visualization application built on MultiTouch Cornerstone SDK, the only toolset designed for building multi-display multitouch applications. Also on display will be the new MT420S MultiTaction Cell 42”, launched at this year’s ISE. The new MT420S is the most advanced interactive display in its size range. Other demos in the MultiTouch ISE 2012 stand include the 2x 55” Stacked MultiTaction® Augmented Reality Table; the MT550W7 MultiTaction® Cell 55” Full HD LCD Embedded Windows™ 7 unit; a fully integrated multi-user interactive display with Windows 7 embedded inside, and a prototype MT550W7 unit with Windows 8 Developer Preview, as well as real-life object recognition on various interactive displays. interactive scape, which specializes in multi-user creative application development, has previously worked with MultiTouch on the Audi Efficiency Table, which is installed in several automotive shows in Europe. The application enables visitors to play a 360-degree animation, with videos, pictures and information on Audi automobiles. MultiTouch MultiTaction products provide support for the industry’s widest range of development tools, including the MultiTouch Cornerstone software development kit (SDK), Microsoft Surface 2 SDK, and all TUIO-compatible tools. An external computer with Windows, Linux or Mac can also be used to connect multiple Cells into ever-larger installations. interactive scape develops objects, installations, and rooms that are both intuitive and engaging. Their field of work encompasses tangible computing and computational design – applying computational approaches to design problems. Their relationship with universities in Berlin and Munich, as well as proven prototyping companies, enables them to stay up to date on research, development and integration of complex solutions. They deliver multisensory hardware and multimedia software to create state of the art multiuser experiences. Based in Berlin, Germany, further information on Interactive Scape is available at the company web site at www.interactive-scape.com. AMSTERDAM – MultiTouch, Ltd., developer of the world’s first modular multitouch LCD screen for large-scale displays, today announced that it has expanded its MultiTaction® line of interactive displays with two new 42” displays, offering commercial systems integrators a smaller unit with superior design elements and the rich features associated with MultiTaction technology. The MultiTaction Cell 42” MT420W7 is the industry’s first embedded Windows™ 7 multitouch display for its size, featuring the Intel® Core™ i7 processor. The companion MT420S offers a stackable product that can be designed for large wall, table, or asymmetric display configurations. MultiTouch now offers its MultiTaction products in 42” and 55” sizes, building on the promise of the company’s patented technology, which provides superior imaging, resolution, and scalable frameless design for manufacturers, developers, and integrators. The new 42” MultiTaction Cell is geared towards demanding retail, museum and corporate installations where a smaller screen size is required. Computer Vision Through Screen optical imaging-based touch technology designed for operation in wide range of environments and in changing light conditions. The MT420 series products demonstrate the benefits of the MultiTaction architecture, which allows any size LCD display to offer full multitouch capabilities. The products offer MultiTouch’s characteristic full-hand tracking – rather than finger tracking - for the ultimate touch response in multi-user applications. The products are available now for orders directly from MultiTouch or through MultiTouch resellers around the world. The MultiTouch 42” products are the third release using MultiTouch’s MultiTaction® platform, which was released in 2011, and includes the second in the line of Embedded products optimized for single-display installations. MultiTaction builds on MultiTouch’s patented optical imaging technology Computer Vision Through Screen for multitouch displays and provides the world’s most advanced set of touch, gesture and object recognition capabilities. The new MultiTaction® products are Full HD displays that can accommodate unlimited numbers of touch points and an unlimited number of concurrent users with full hand recognition. The combination of the advanced interaction features and ultra-fast 200 fps tracking enable the most engaging interactive user experiences to be developed and deployed. Full networking capabilities allow for cloud applications, social network integration as well as remote management and monitoring. MultiTouch will demonstrate the MT420W7 and MT420S at its ISE 2012 stand #11K37 themed “World of MultiTaction” in the RAI Amsterdam, from Tuesday, January 31st through Thursday, February 3. The MultiTaction demonstrations will include both the Windows 7 product as well as the prototype Windows 8 Developer Preview installation. The MT420W7 and MT420S include an upgrade path to Windows 8 with the touch-optimized Metro user interface, which will be commercially available later in 2012. Both products include support for the industry’s widest range of development tools, including the MultiTouch Cornerstone software development kit (SDK), Microsoft® Surface 2 SDK, and all TUIO-compatible tools. An external computer with Windows, Linux or Mac can also be used to connect multiple Cells into ever-larger installations. The MT420W7 is the second embedded interactive display to use the 2nd generation of Intel Core family of processors, which enable faster response to multiple touches. MultiTaction units are designed for interaction with real-life objects – whether retail products, 2D barcodes, or game pieces, for example – and can be stacked to any size or shape using tens of units. The product’s frameless thin bezel design enables MultiTaction to be embedded in custom-designed furniture. The smooth edge-to-edge front glass on the display unit is a first for any multitouch display. Further information and a white paper on MultiTaction can be found at www.multitaction.com. For more information, please visit www.multitouch.fi and www.multitaction.com, as well as the MultiTouch YouTube channel at http://www.youtube.com/multitouchfi, and www.twitter.com/multitouchfi for further MultiTouch updates.